I do not buy coins or provide appraisals. asking for information about selling coins. 5-May 2011 update: Added Republic Coins of India to the links page. 7-January 2011 update: Added Surana Art to the links page. 20-July-2010 update: Ravi Shankar Sharma sent photos of two interesting coins. First is a Victoria 1862 A/II 0/6 dot Rupee with an interesting dot pattern (see photo at right). Second is a 1862 A/II 1/10 Dot Rupee with three additional "micro dots". Could this be a 0/13 dot Rupee? See photo below. He also provided a link to his new coin club web site NUMISMATIC SOCIETY OF CALCUTTA. I have added a link to this site to the Links to related sites page. 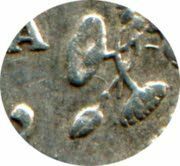 19-April-2010 update: Murali Thantry sent an interesting scan of a Victoria 1862 A/II 1/10 dot Rupee (see photo at right). Like a similar A/II 1/7 Rupee earlier reported by Gev Kias this Rupee has the top dot in the flower. The comments by Murali Thantry: "I recently procured a 1862 A/II 1/10 Dots coin, but the variety is the Top Dot is on the Top Flower (similar to 1/7 Reported by Gev Kias). I'm here with sending you the scan of the same for your perusal and upload the same on to your web pages, if possible." This information has been added to the dot-Rupee page with more detailed photos. I have been asking around the internet for coin people who may have encountered a 1910 Two Annas with a dot on the stem. The following reply just reached me: "Yes the 1910 two anna which you mentioned is [k]nown to me and also several other dates with the dot on stem. This dot on stem was typical of Bombay mint but on several occassions mint marks have been interchanged or con[f]used due to lack of proper documentation. Like the 1938 rupee.There's no CALCUTTA mint. Only bombay mint produced them and initially forgot to put the dot. 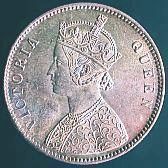 - Vivek"
While the 1/12 anna, 1/2 pice, 2 annas and 1/4 Rupee coins of King Edward VII were struck only at the Calcutta Mint, the one anna-coin was struck at the Bombay Mint, and had a small incuse 'B' in the King's crown on the obverse. The other two coins in the series were struck both at the Bombay and Calcutta Mints. Bombay Mint specimens of the rupee and 1/2 rupee coins had, on the reverse, an incuse 'B' at the base of crown, and a small 'dot' on the stem of the bottom lotus-bud in the right-hand spray. Since the 'dot' itself was found adequate to distinguish the products of the mint, and there was no need to have a conspicuous mint-mark as an incuse 'B', from 1906 onward there was apparently an attempt to erase the 'B', but not very successfully. Since this was done by filing off the raised 'B' in the 'coining dies', the deeper parts of the two hollows of 'B' and sometimes parts of the outline remained; and these showed up in the struck coins as a raised pair of indistinct 'dots', with or without a feint outline of 'B'. The Calcutta Mint products had no specific mint-mark. Three 1910 samples of 1910 2-annas showing "dot" on lotus stem, similar to the Bombay mint mark on the Rupee coin. First two photos are of coins found by William E. Naquin, photos by David Harwood of Bangkok, Thailand. Last coin photo is from Girish Bhambani, as noted above. 11-November-2009 update: Photos of two features not formerly documented here have been added to the description of the Rupees of Edward VII. Both the raised "B" mint mark and the rare mistake with the Persian script on the 1903 Rupee are now shown. 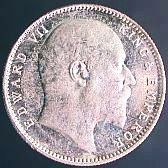 See Rupee of Edward VII. Thanks to Niraj Agarwal for providing these valuable photographs! Also, a link to a new web site for the Delhi Coin Society has been added to the Links to related sites page. 25-October-2009 update: A link has been added to the Links to related sites page for the Uttarakhand Worldwide page which provides some commentary on India history along with coin photos. Thanks to BC Joshi of India for sending the link. 17-August-2009 update: A link has been added to the Links to related sites page to Ancient and Midieval Indian Coins. Thanks to Sarah for sending the link. 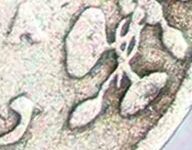 There are also three new photos of the dot variety of the B/II 3/0 Rupee, which I have added to the 1862 Rupee Dot Varieties page. Thanks to Ravi Shankar Sharma, Secretary of the Numismatic Society of Calcutta, for the first two. The third was sent by Murali Thantry. Note the similarity between the 2nd and 3rd dot patterns. 21-July-2009 update: Ravi Shankar Sharma, Secretary of the Numismatic Society of Calcutta, has sent in photos of an 1862 A/II 0/12 Rupee which I have added to the 1862 Rupee Dot Varieties page. Like. the A/II 0/9 Rupee below, the dots are in two distinctive rows. 20-April-2009 update: Satyajit Pai has discovered an interesting variety of the 1862 A/II 0/9 Rupee. 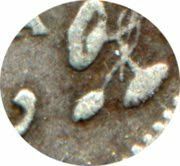 He provided some good quality scans of this interesting coin, which have been added to the 1862 Rupee Dot Varieties page. One expert felt it would be more appropriate to lable this coin as A/II 0/6+3, since the dots are in two distinctive rows instead of the more common single row of dots. The 9th dot is also merged with the whorl design. 14-July-2008: New India Coin Web Site and Forum! Congratulations to Dr. B Jinadatha on the creation of the excellent india-coins.com web site. The scope is much greater than just the coins of British India and the site covers coins from ancient India right through modern India. Highly recommended! India Coin Forum: india-coins.com also incorporates a fantastic new resource for collections of the coins of India, namely the India Coins Discussion Forum. If you have comments or questions about the coins of India you now have a place to post. I encourage India coin enthusiasts to register at this forum and visit on a regular basis. Set a bookmark/favorites so you can visit easily and often. There aren't a lot of posts yet but it will surely become one of the most useful resources on the Internet for India coin enthusiasts. Don't wait ... register now! 5-October-2004 update: Thanks to a fellow collector I have added numerous examples of the 1862 dot patterns to the Victoria 1862 Rupee Dot Varieties page. An exciting update to the Victoria Rupee Reverse Types page ... a new type IV not identified by the Krause or other catalogs has been added. This type was identified by W.A.T. Aves in print in 1984 and confirmed to me by Bob Johnston recently for rupees date 1879-1882. Whether type II and type IV were both used in 1881-1882 is unknown, but both types are known for 1879-1880. Your input would be welcome. 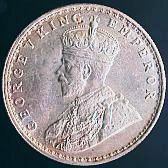 The George VI coins are proving difficult and will take a considerable time to sort out, so the George VI Page will be updated slowly. -- Franklin Campbell Contact Webmaster. 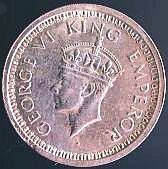 The purpose of this web site is to describe the beautiful coinage of British India 1862-1947. The attempt has been made to fully document every major variety using high-quality photographs. This should allow collectors to accurately identify their coins, and buyers/sellers can agree on the coins being bought and sold. My hope is that this web site will be useful to all collectors of British India and help popularize this most interesting area of coin collecting. The combination of beautiful design, high quality strikes, interesting varieties and relatively low cost makes for an ideal subject for study and collecting. User input with corrections, additions or other commentary is most welcome. Note that this site will be under construction for some time ... I'll be adding features and content as time and enthusiasm allows.